a. Description. 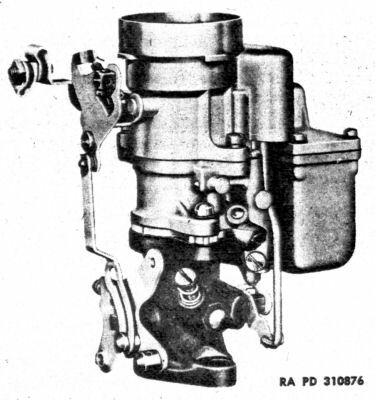 The carburetor (figure above) is of the conventional downdraft, plain-tube type, with a throttle operated accelerator pump and economizer device. The carburetor is a precision instrument which delivers the proper fuel and air mixture for all speeds and operating requirements of the engine. b. Adjustment. 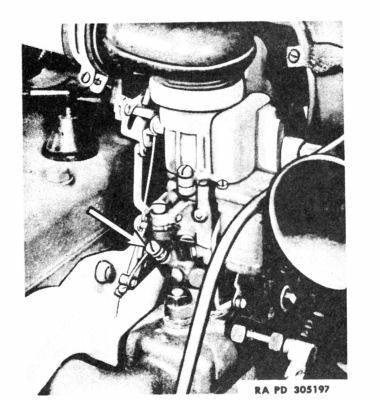 The idle adjustment screw indicated in the figure above is the only service adjustment provided on the carburetor. To obtain the approximate correct setting, turn the adjustment screw to the right and all the way in, but do not jam the screw against the seat, then, back out adjustment screw between one and two turns. To make the final adjustment, warm up the engine, and adjust the screw until the engine runs smoothly. Set the throttle stop screw so the engine will idle at 600 revolutions per minute (vehicle speed, 8 mph). Replace/Rebuild carburetor if it requires other attention. c. Removal. Loosen clamp on air horn and flexible air hose, and remove air horn. Remove throttle and choke control wires. Disconnect throttle control rod at throttle lever. Disconnect fuel line at carburetor. Remove carburetor flange nuts and retracting spring clip, and lift off carburetor. d. Installation. Inspect condition of gaskets between carburetor and manifold, and install new gaskets, if required. Install carburetor retracting spring clip, and carburetor flange nuts. Tighten nuts evenly, Connect throttle control rod, and throttle and choke wires. Install carburetor air horn, and tighten clamp screws. Adjust carburetor (paragraph b above). Edited from TM 9-803 & TM 9-1826A.